May 2018: What's Going On With Bonds? This year we have experienced the extreme highs of January, the plummet of February, and the zigzags of March. Yet, as I write this, Morningstar’s year-to-date benchmark for the broad U.S. stock market is up 0.9%. This isn’t bad considering we are facing a possible trade war with China and an actual war with Syria. Not to mention the shockwaves the privacy scandal of the social media giant, Facebook, sent through the technology sector that still ripple today. I think those risks to the stock market are minimal. A trade war with China is highly unlikely and while information technology companies might face higher regulations, they will still make a lot of money. There is another component to most investors’ portfolios that is as important as stocks - bonds. The vast majority of investors depend on the bond market in one way or another. 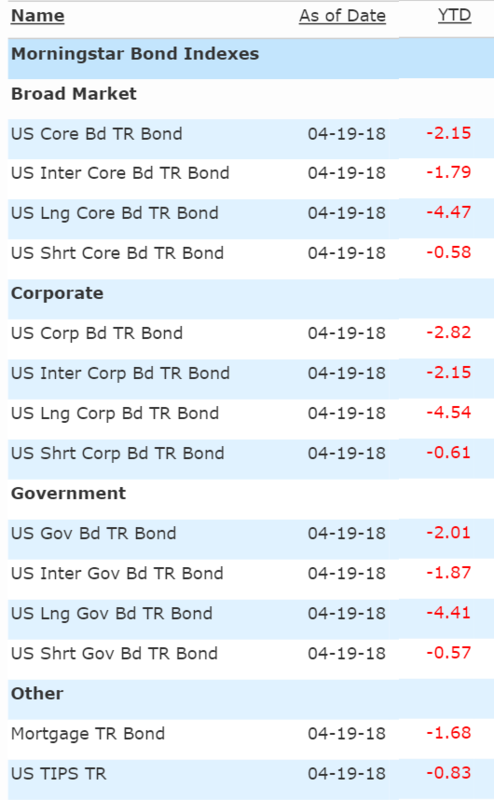 As of April 19th, there wasn’t a single Morningstar bond benchmark that is positive for the year. The areas most retirees invest in are down as much as 4.5%. How is that possible? Bonds are supposed to be less risky than stocks, right? Although bonds tend to be less volatile than stocks, it is not true that bonds are always up when stocks are down. Nor is it true that if the stock market is highly volatile, bonds will outperform stocks. The “60/40 split”1 mentality (a portfolio comprised of 60% stocks and 40% bonds) has persisted due to the following reasons. First, and rightly so, it is always a good idea to diversify your portfolio. In other words, invest in different things that move in different directions. Stocks and government bonds tend to have low or negative correlations. That means their price movements are either not correlated at all or negatively correlated. In other words, as stocks go down, government bonds tend to go up. Second, there were fewer investment choices available in the 80s. You couldn’t log onto your favorite brokerage website and buy energy, infrastructure, currencies, or real estate funds with just a click of your mouse. Third, rates were in rapid decline in the 80s and 90s, and when rates go down, bond prices go up. But why is that? Here is a very basic illustration of how changing interest rates can have a significant impact on existing bonds, especially those with fixed interest rates like treasuries. Let’s say today you pay $1,000 for a bond that is going to pay you $50 (or 5%) per year for the term of the bond - or until you sell it. One year from now, newly-issued bonds that sell for $1,000 are paying $40 (or 4%) per year. Your bond is paying more than the going rate, so the value of your bond goes up. If you wanted to sell it, you’d probably get about $1,250 for it. That is a pretty good return. Fast forward ahead two years. Bonds that sell for $1,000 are paying $60 (or 6%) per year. Now your 5% bond is not worth as much as the newly-issued bonds are. If you sell it, you’d probably get $833 for it. Obviously, bonds have a set maturity date and aren’t perpetual. Bond funds generally don’t have an end date, so if you invest in a bond fund and not individual bonds the effects can be similar, though much less severe. The chart below shows 10-year Treasury yields dating back to the late 50s. It has been a bond investor’s paradise. 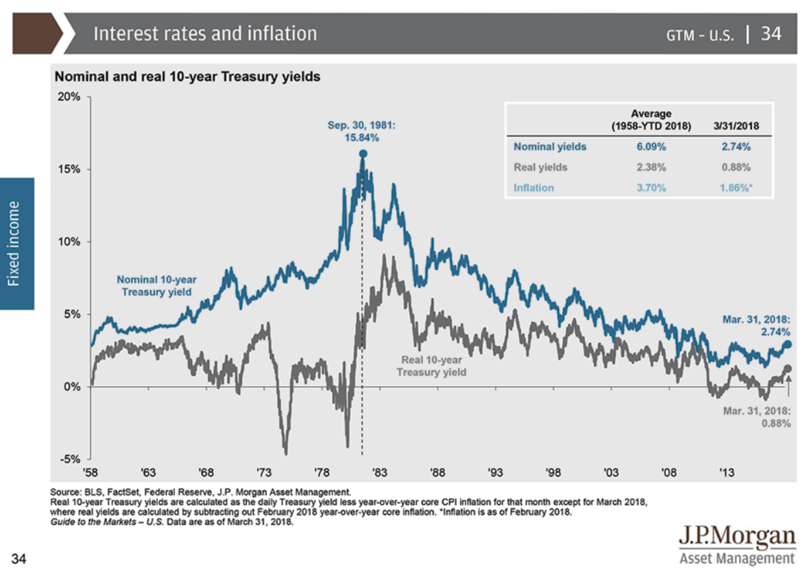 See how rates have been declining since the mid-80s up until late 2017? As evidenced by negative bond returns so far this year, and with rates on the rise, that paradise might be drying up. In my opinion, if the era of declining interest rates is over, then going forward, traditional bonds will have a tougher time than in recent history. The Federal Reserve is expected to raise the target for the Federal Funds rate 2-3 more times this year. That action will push all other interest rates higher along with it. What does all of this mean for investors? It does not mean you shouldn’t own any government or fixed rate bonds. This is because they are still good diversifiers and if stocks fall dramatically, they would probably still be a good insulator from that risk. However, that should not be your entire bond investment. The good news is there are many more diverse and broad investment choices now than even a decade ago. We have ways to invest in bonds that aren’t impacted by the risk of rising rates. There are also other conservative asset classes that aren’t correlated with bonds but will still bring down the risk of a portfolio. Some may be an excellent fit for you. I am not permitted to speak about specific products in my market commentary, but we love to share our ideas with you. To learn more, call or email us. 1There is no guarantee an investing strategy will be successful. Diversification does not eliminate the risk of market loss.